Green grass. Tall trees. Big bushes. A few nondescript flowers. It is a typical, unassuming backyard—until Spring Magic starts. Suddenly, the calmness is shattered by the reverberations of a blood-red door slamming and the pistol-crack of a latch being sprung. A gate explodes open as a young man rushes into the yard and throws himself onto the ground. In an exhausting battle with tormenting thoughts, the young man beats his head, muddled from the turbulence of life and with his palms on its brow, against the ground. He grabs at his hair and tugs in vain as if trying to pull life’s worries and pressures out of his head like weeds. The cedar gate swings again upon its hinges—this time slowly and quietly—and re-clasps itself, a soft click sounding as the latch secures. Then, gently, methodically, patiently, the magic of nature’s repose begins its work upon the still-churning soul of the backyard garden’s owner. The man’s eyes shoot open and his arms fling to his sides as the seemingly audible command gently works its way into his thoughts. Propped on his elbows, he scans the area, searching for the unbidden visitor. He sees nothing but nature. A soft breeze whispers through the tops of the oaks bordering the garden, the gentle sway lulling his agitated heart to rest. He lets his head fall slowly back into the soft blanket of grass and listens. A dull-red cardinal, the female, swoops peacefully across the yard with a quiet whoosh and flutters into a tall, thin arborvitae with a worm in her mouth as her young sing out a chorus of thankful chirps. Sitting atop a gently rocking electrical line strung above the garden, a soft gray-brown house wren encouragingly adds its bubbly, piccolo-like titter to the soothing symphony of nature. A cheerful robin sitting atop an evergreen bush, refusing to be outdone in avian kindness, offers to the young man a song of his own, a bright song from deep within his red breast that seems to say, “If God takes care of the birds of the air, how much more will He take care of you.” In this gentle counterattack of the sights and sounds of nature, the young man’s face finally relaxes. Again the inaudible voice breaks through the din of his mental battle and the young man stops tossing and turning. As he lies, still panting, upon the lawn, the soft carpet of grass massages his back, and the sweet, grassy smell wafts to his nostrils, its light sweep across his face smoothing the creases in his brow. The nearby roses release a calming perfume into the air as they reach their limbs toward the warm morning sun. The blossoms covering the spiraea like snow raise their aroma in a gesture of rejoicing for the sunlight streaming through the soft, puffy clouds. The young man smells more than sees the newly-sprouted cucumber and zucchini plants as they yawn, stretching themselves out of their receiving blankets of soil, shaking out of their new-born fibers the long winter slumber they’ve spent in their seed-wombs, readying themselves for a productive and fulfilling summer life. “If God so clothes the plants of the field, how much more will he clothe you.” The young man rubs his arms lightly, the veins diminishing little by little as the gentleness of nature’s diversionary assault on his olfactory senses gradually overwhelms the attack on his mind. But the young man’s enemy, though in the throes of defeat, refuses to surrender. It regathers its strength for yet another attack. A short time passes, and the violent thoughts are finally, utterly vanquished. All right then, he murmurs gratefully in a long, deliberate sigh that blows away the last remains of the tempestuous thoughts. He sits up and looks around. Knowingly, the cedar gate unclasps itself and swings wide. The arborvitae standing next to it gently waves one of its bottom branches, beckoning, encouraging the young man to now return, refreshed and energized, to his house and to his life. As the young man obeys the branch waving in the breezeless air, he walks slowly, calmly, relishing in the new-found beauty of this formerly typical, plain-Jane backyard: the verdant carpet of blue-green Kentucky fescue; the border of towering, venerable oaks and uplifting, soothing arborvitae; the accents of perfectly-shaped evergreen globe arborvitae and soft spiraea bursting with blossoms; the yard-sized bouquet comprised of fragrant lavender dwarf lilacs, invigorating burgundy and ivory hybrid tea roses, and splashes of petunias in purple and pink. The backyard has been magically transformed into a garden of Gods’ peace and comfort. The young man passes through the open gate, then stops suddenly, his hand upon the knob of the wine-colored door, a look of utter amazement upon his face. He whips his head around and stares in disbelief at the one branch still waving while the others remain motionless, and at the gate swinging slowly shut, both as if stirred by a gentle breeze. But there is no breeze. He smiles, thankful for nature’s parting reminder that the breeze of the Spirit is always with him, whether he senses it or not. Just before entering the house and softly closing the door, he watches as, in the already perfectly calm air, the tree stops waving its branch, the gate gently swings closed, and the latch quietly clicks shut. 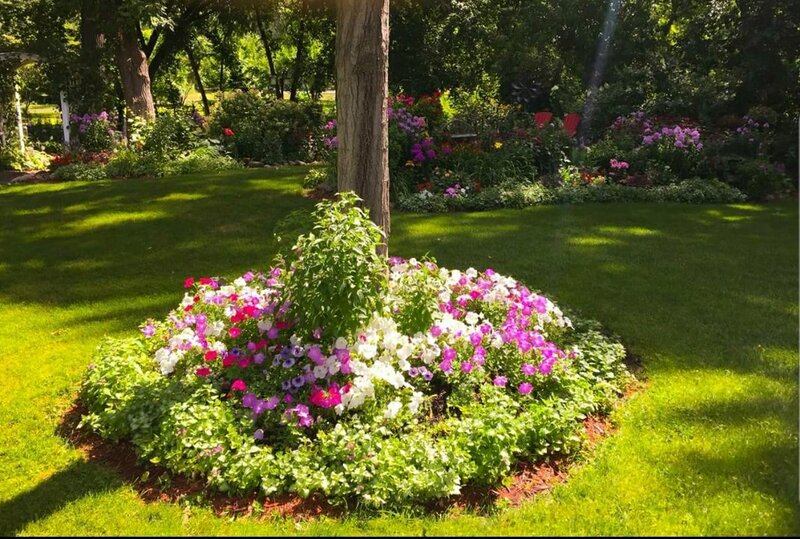 The peceful garden image replete with gorgeous flowers and a soft carpet of grass encircling a stalwart tree is used by permission from Tim Burt of the “Today’s Fresh Mana” blog. I saw this quote on a coffee mug at work. It seems so appropriate I thought I’d add it. This is such a beautiful story! Awww the way it captures the anxieties of man! Wow, it’s like you dove into my head and mined my darks thoughts, in a gorgeous display of hope. I hated church and I hated God because I felt abandoned by my congregation and punished by my best friend. I was a Christian once, but the fluffy problems and the victim blaming that I encountered pushed me away just enough to allow the darkest of nights to fill my soul. I was left out cold to freeze to death infront a glittery aulter, feeling alone, abondoned, and blamed for my grief. The god you describe in this passage is the god I hoped for but never found. I saw this yesterday on a coffee mug at work. It is so appropriate to my Soul Spring Magic post I thought I’d share it. “I love to think of nature as an unlimited broadcasting station, through which God speaks to us every hour, if we only will tune in.” What an incredible quote! Love this post…great job, James! Thx. I appreciate you taking the time to visit! So beautiful and peaceful James. I thoroughly enjoyed this. I really do enjoy your writing. It’s very lyrical and evocative.